The differences between Russian and French cuisine are many, but hereґs one of the most important: French food is urbane, it beckons you forward while always managing to stay a few steps ahead, like a mysterious beautiful woman. Russian food is basic, nourishing, domestic. Like mom, it simply smothers you with love. Thatґs why you can eat French cuisine at home, but still picture it being served in a restaurant, while Russian cuisine will always have something homemade about it, no matter where it is served. Golubtsy, or stuffed cabbage, is perhaps the homiest of all Russian dishes. For most children of the Soviet Union, golubtsy bring back memories of mom or grandma and long, comforting meals in a warm kitchen. But while they are considered among the most Russian of foods, their origins are foreign, as is the origin of their name. 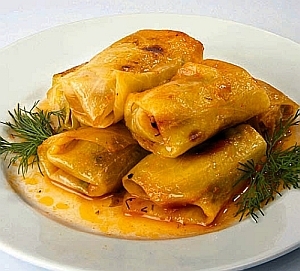 Golubtsy are cousins to dolma, grape leaves stuffed with meat that are popular in the Caucasus and Greece. As they headed up north to Russia, cabbage supplanted grape leaves, which did not grow well in the local climate, and beef replaced the lamb used in the south. They appeared in Russia in the 18th century, a time when French cooking was getting its first wave of maniacal followers in St. Petersburg. The dish earned its name for the French practice of cooking pigeons wrapped in cabbage leaves - the Russian word for pigeon is "golub." Wash cabbage and remove leaves, then soak leaves in boiling water for 1-2 minutes until they are soft. Trim thick center vein from the bottom of each leaf. Wash and clean carrot, chop into thin strips. Sautee carrots and diced onions until tender. Boil rice to half-readiness - make sure the rise is still somewhat hard, otherwise it will turn to mush when you boil it again. Wash tomatoes, then puree tomatoes in a blender. Clean garlic and crush in a garlic press. Combine ground meat with rice, onion, carrot, garlic, tomato paste and parsley, add salt and pepper to taste, mix well. Place 2-3 tablespoons of meat on each cabbage leaf. Fold sides of cabbage over filling, and, starting with the stem end, roll the cabbage into tubes. Press the mixture into the leaves. Line the bottom of a pot with cabbage leaves and place the rolled golubtsy inside. Boil water, add tomato paste, and pour into pot. Cook over a low flame for 45 minutes to an hour. Check for readiness - cabbage should be soft but not mushy, meat should be cooked through. Serve the golubtsy with the sauce they cooked in, and a dollop of sour cream.